"This recipe has been created with the idea of lowering the fat content. These are so delicious -- you'll never miss the fat!! Can also be made as a quick bread. Pour batter into an 8 x 4 inch loaf pan, and bake at 350 degrees F for 45 to 50 minutes." Preheat oven to 400 degrees F (205 degrees C). Coat a 12 cup muffin tin with nonstick spray. Whisk together flour, baking powder, soda, cinnamon, salt, and sugar. Mix in egg whites, applesauce, and banana mash until just moistened. Stir in chocolate chips. Divide batter into muffin cups. 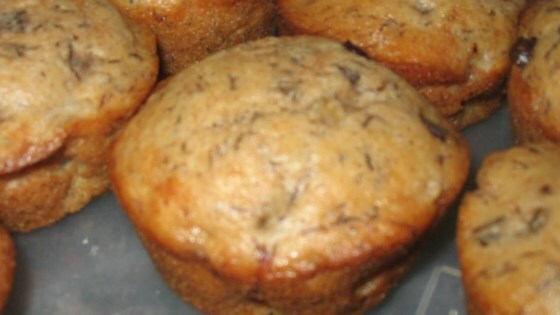 These muffins were a little spongy and didnt rise very much. I dont think I will make them again. I'll admit I love making theses. 1 thing I tried that I like better is using light brown sugar, instead of white sugar. Try it I think you'll it like it too! I added vanilla, extra milk, and extra chocolate chips. They were great! Very Good! Used 1 whole egg. Mine were done perfectly at 15 minutes. These are good for low fat.